A hog or spit roast is an amazing centrepiece for your special occasion, regardless of the type of party or event you have in mind and when it’s prepared, cooked and served by Hog Roast Ballyclare, you have a real winner on your hands. We’re loved for our delicious food by people all over the country as well as locally, whether for our scrumptious pigs in buns, a hot hog or spit roast meal with vegetables, potatoes, and gravy, or even for our additional and alternative options, such as starters, desserts, sides or dishes for special diets. Hog Roast Ballyclare recently catered a wedding for Bree and Danny, where they wanted a theatrical feel to their main course (and a hog roast can always provide this) but they also wanted more courses to be served to the guests at the tables. We always work together with our customers to create the perfect menu, and for Bree and Danny’s special day, this meant sitting down well in advance in order to decide what to serve for the starter and dessert, as well as to cater for the vegetarian guests they had invited. The couple wanted us to cook a hog roast to make pigs in buns for the main course, where they would queue up with their guests to be served buffet-style, once we had carved the crackling off and sliced into the meat and filled bread rolls and wraps with both, and then topped off with our own apple sauce and stuffing. Plus the vegetarians would enjoy a feast of veggie skewers, pitta bread and a Tzatziki dip for their main. On the day of the wedding, Hog Roast Ballyclare got cracking preparing and cooking the meat. Once the guests arrived, we served them welcome drinks, and then once everyone was seated, we served our homemade vegetable soup with fresh bread rolls, followed by the lovely main course. 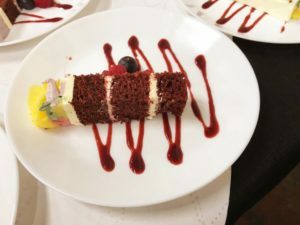 The couple had decided to serve their wedding cake for dessert, so we cut into it and plated it up, added a fresh fruit coulis and served the guests something lovely and sweet to finish off the gorgeous wedding meal.